Marc shares some of the events that happened on this day in history, including the election Gamal Abdel Nasser as president of Egypt after he led a coup against King Farouk, the births of June Carter Cash and Clarence Thomas, and the death of Betty Shabazz. 1936: The U.S. Congress designated the last Sunday in September as Gold Star Mother’s Day, honoring mothers who have lost a child in military service. 1956: Following the army coup led by Gamal Abdel Nasser that deposed the regime of King Farouk Gamal Abdel Nasser is elected president of Egypt when he stands as the sole candidate. 1962: Ray Charles started a 14-week run at No.1 on the US album chart with ‘Modern Sounds In Country And Western Music’. 1972 – Watergate Scandal: U.S. President Richard M. Nixon and White House Chief of Staff H. R. Haldeman are taped talking about using the Central Intelligence Agency to obstruct the Federal Bureau of Investigation’s investigation into the Watergate break-ins. 1999: Each state is in line to receive large amounts of money after the landmark settlement by the tobacco industry, The money should be used to fund anti smoking measures and help reduce the numbers of smokers in each state but many worry that this major windfall will not be used to help educate our next generation in the dangers to health of smoking. 1929: Born on this day, June Carter Cash, country singer, wife of Johnny Cash. Died 15th May 2003 aged 73. Had hits with Johnny Cash, ‘Ring Of Fire’, ‘Jackson’, ‘If I Were A Carpenter’. 1957: Born on this day, Lee John, Imagination, (1982 UK No.2 single ‘Just An Illusion’). 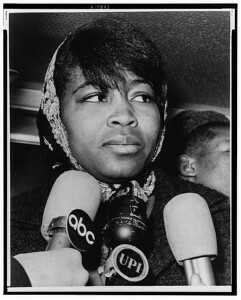 1997 – Betty Shabazz dies at 61, in NeW York City 3 weeks after receiving burns over 80% of her body. 2003 – Maynard Jackson, three term mayor of Atlanta dies at age 65. 2006: Prolific television writer and producer Aaron Spelling died at the age of eighty-three after suffering from a stroke five days earlier. Spelling’s most notable television productions included Charlie’s Angels, Dynasty, Starsky and Hutch, Beverly Hills 90210, Melrose Place, 7th Heaven, and Charmed. 2009: Ed McMahon, an iconic American television personality, died at the age of eighty-six after suffering from multiple health problems. The television star was best known for working as Johnny Carson’s co-host and sidekick on the Tonight Show for thirty years. McMahon got his big break in 1958 when he was the announcer on the show Who Do You Trust? alongside host Johnny Carson.